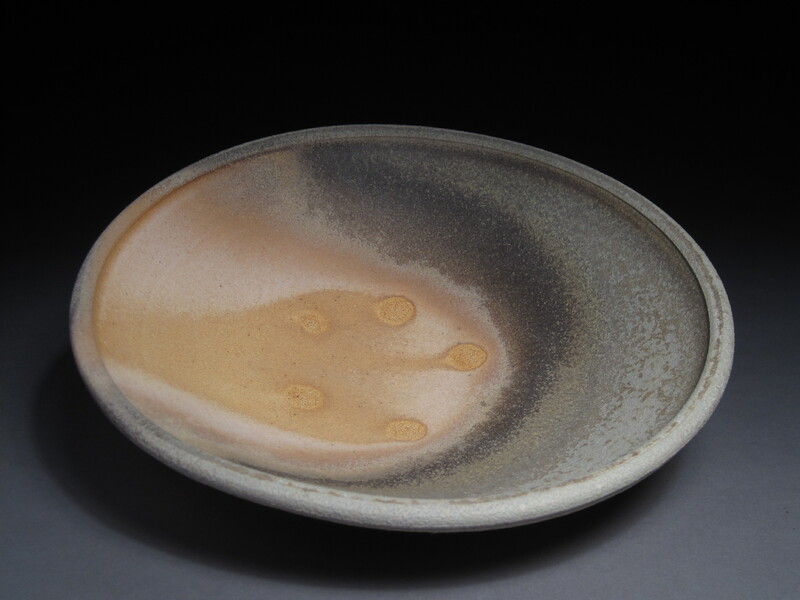 Jules Stout Ceramics | Use this site to learn more about Jules’ ceramic work and to discover ceramic related websites around the world. 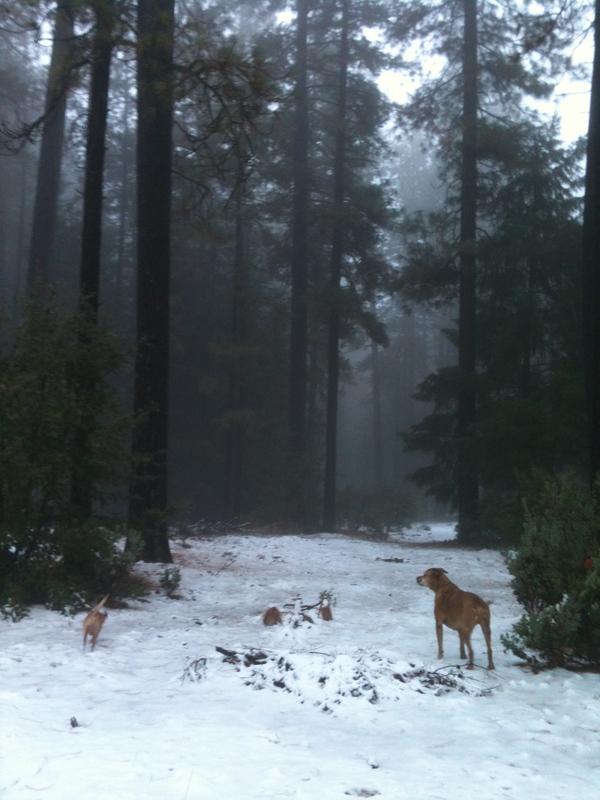 It’s been a long, cold, wet winter here up on Cobb Mountain…the wettest in decades. We burned almost twice the amount of wood to heat our house as in years past. Fortunately, the days are growing longer and the daffodils are blooming all around. It’s been ten years since I attended my first NCECA conference in Portland with my faithful k-9 companions, Riley Paul and Moku. It was pivotal to experience the convergence of the world of clay in one city for an incredible week of sharing artwork and ideas. I am off to Portland again tomorrow, not as a young, wide-eyed student, but this time as a mother and a ceramics instructor. 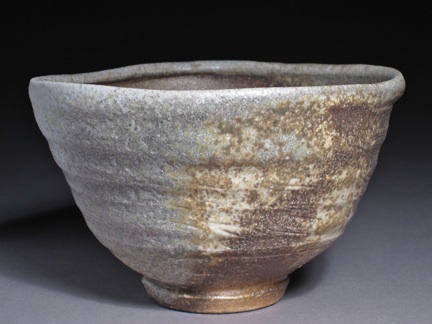 I am thankful for this opportunity to celebrate and be invigorated by clay artists from around the world. Last NCECA my little stoking assistant Cassidy was with me, but this time I will be attending without her, which leaves me feeling bitter sweet, but I will be taking one of her little woodfired pieces with me. I helped fire the train kiln at the Cobb Mountain Art and Ecology Project in February so I have some fresh woodfired work for Art Gallery Napa Valley . My little studio assistant was a big part of the firing crew this firing and was excited to unload her first woodfired pinch pots. 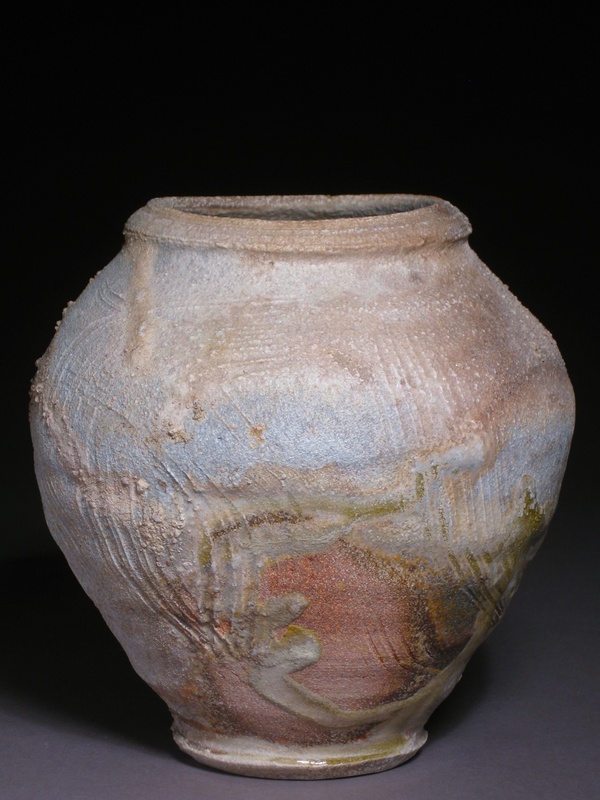 My heart is swelling with anticipation about the Cobb Art and Ecology Anagama kiln. Construction will begin soon and we’re hoping to fire before summer arrives. 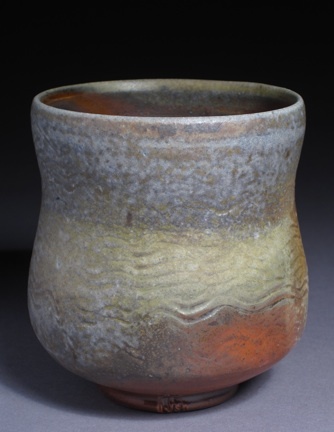 I look forward to having a body of Anagama fired work for sale at the Napa Valley Open Studio tour in September. Many new students have brought renewed energy to my classes at Calistoga Art Center in the past couple months. We’ve begun making plates for our Small Plate Social fundraiser which will be held Saturday May 20th this year. Please join us for an evening of music, food and drinks and help us raise money for new electric and banding wheels for the studio! Thanks for checking out my blog. Please leave comments so I know you were here. Saturday September 12th 2015 was an unusually warm and windy day. Thousands of pine needles were twirling their way to the ground. An eerie haze filled our normally crisp blue sky. Cassidy and I were happily helping stain the trim for the brand new studio at Scott Parady’s Cobb Mountain Art and Ecology Center. We were gathered at the lunch table, the phones began to ring, first my husband Steve, then Scott’s brother Jeff. “Where’s the fire?” Steve asked. None of us had noticed the smoke. “Look outside the front door.” And there it was, a plume of gray smoke coming up over the tree lined ridge against the hazy sky. “I think you should come home” he said as he was driving up from Middletown. I didn’t really have to tell myself to stay calm. I knew I had to. As we walked back to the studio to get the car I started planning what to grab from our house, which was a couple miles closer to the fire than Scott’s place. We had about 30 minutes to pack. The smoke was growing thicker and we could see flames swallowing the homes below ours. Planes and helicopters were passing at eye level dropping loads of fire retardant just below our house. As I walked through the house I said goodbye to special pieces in my ceramic collection that I didn’t have time to pack or room for in our cars. Friends like Christa Assad, Linda Christianson, Andrew Martin, Doug Casebeer, Wayne Branum and my brand new mug from Simon Levin that I’d only gotten to sip coffee from once. There were no firemen or sherifs telling us to evacuate. It was just neighbors knocking on doors to make sure everyone got out safely. When we were allowed to return home after two weeks of being evacuated, the house was filled with the smells of rotting food and sour smelling smoke that reminded me of burning trash. From every room in our home, I could hear our neighbor across the street sifting through her ashes and salvaging what she could of her amazing collection of turn of the century artifacts. I am very thankful that our home survived, but I am still grieving the loss of our amazing Boggs State Forest and so many of our friends’ homes. It’s been six months since we left that day. Seven months since my last posting here. I still don’t feel caught up. Life on Cobb Mountain has changed forever, but our home survived and our yard is still beautiful. 76,000 acres burned in the Valley Fire, but life goes on. The forest is beginning to regrow and the very first families who are rebuilding are beginning to move into their new homes, but most will not be rebuilding. There are too many details and emotions to share here, but I needed to write something about this experience. I needed to explain that I hit this speedbump and that I still haven’t quite regained my footing. It’s March now and I’ve already completed 3 woodfirings this year! Two firings of the Train at Scott’s and the Anagama at University of Kansas in Lawrence. 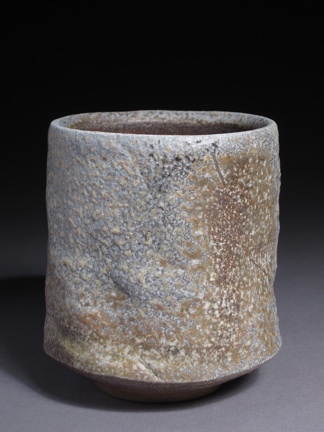 I am at the 50th anniversary NCECA Conference in Kansas City, steeping in ceramic history and creativity right now and looking forward to unloading the KU kiln this Saturday. I shall return to CA Sunday with six weeks left to prepare for Calistoga Art Center’s Small Plate Ceramic Fundraiser and will begin working on building my inventory for the Napa Valley Open Studio tour in September. Thanks for stopping by and checking up on me. Sorry to have been away so long. 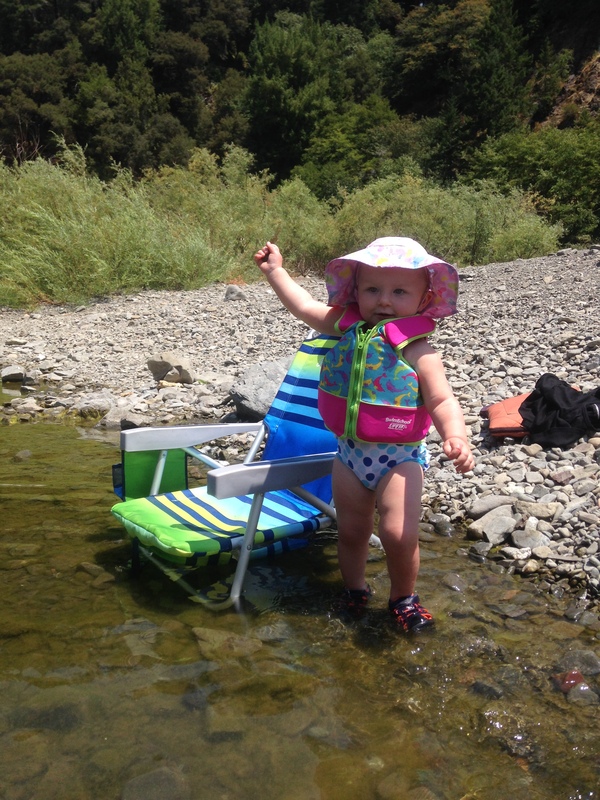 It has been a very busy summer for us up on Cobb Mountain and also down at the Art Center in Calistoga. In between swimming, camping and harvesting from the garden, I’ve been enjoying teaching art camps for kids by day and my evening ceramics classes for teens and adults. 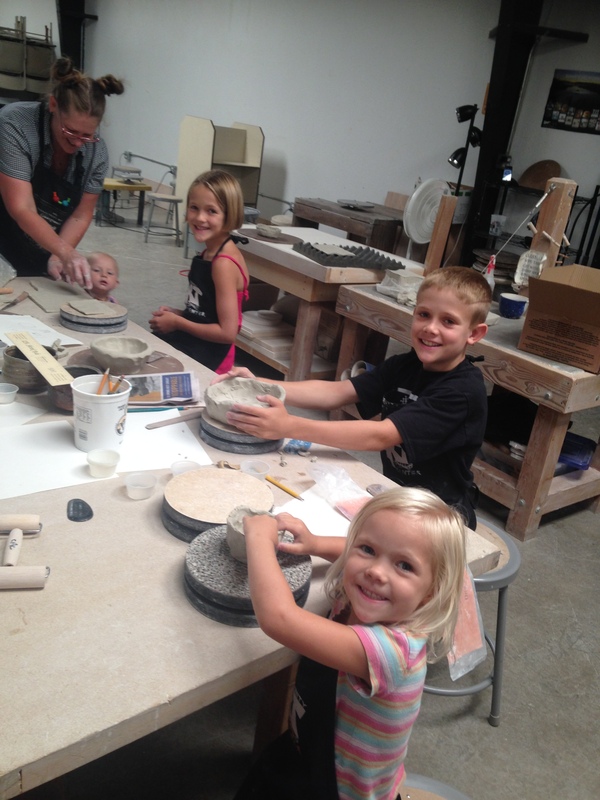 I Love Teaching Happy Potters of All Ages! And coaching my wheel students! August is nearing its end and the brilliant yellow leaves of the Big Leaf Maples are signaling the coming of Fall which means swimming and camping season will be ending soon. As soon as all of the 200 bowls are completed for the Calistoga Art Center’s Soup-er Bowl Fundraiser, I will devote my studio time and my class demos entirely to making work for the Train Kiln firing in November at Scott Parady’s Cobb Mountain Art and Ecology Center. 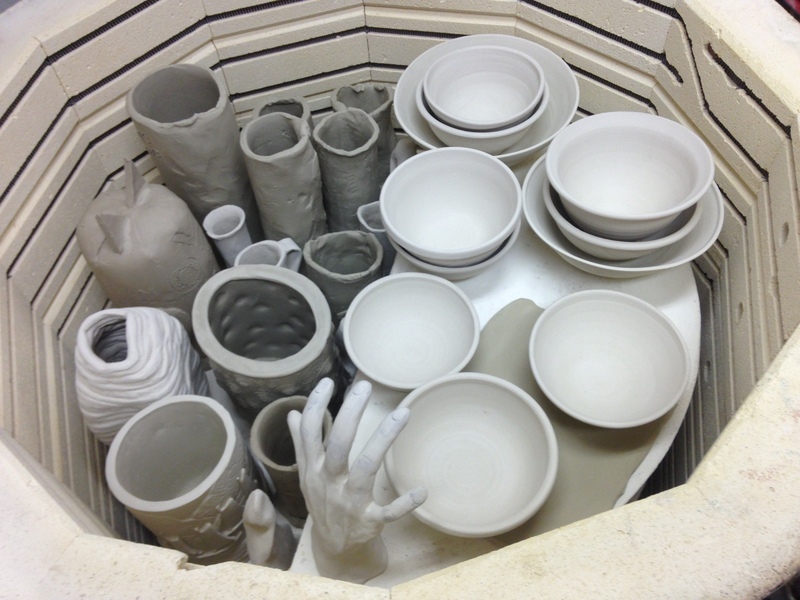 Soup-er Bowls and Student Work Fill the kilns weekly! I am also getting excited about planning my trip to Kansas City for the 50th Anniversary NCECA Conference in March 2016. 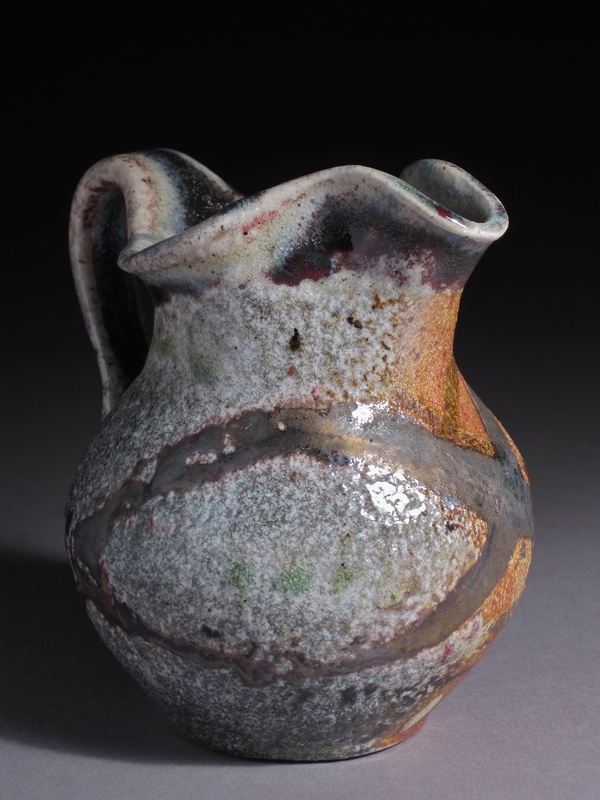 Check out Calistoga Art Center online for the Fall schedule of classes. I’m excited to be adding a weekly kids’ class on Wednesdays from 2:00-4:00pm! Take Care and Enjoy the Changing of the Seasons! June is almost here and the days are getting long and bright. At home on Cobb Mountain the grasses in the meadows are turning yellow As the strawberries are growing red and sweet. 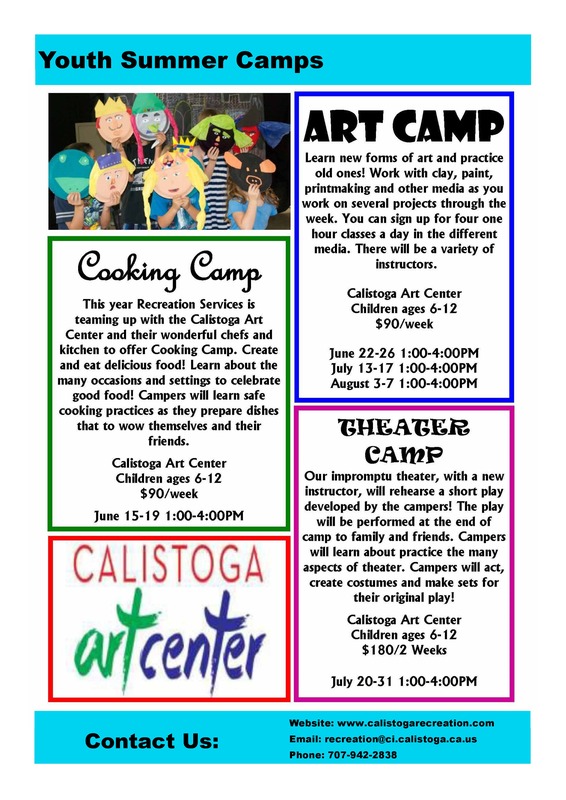 Over the hill in Calistoga we are gearing up for a busy summer at the Calistoga Art Center. 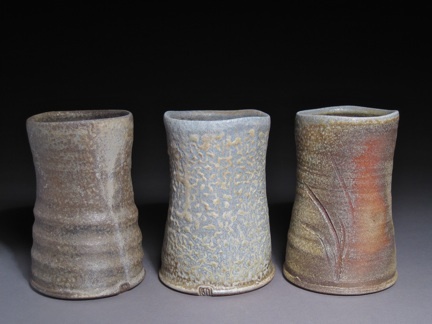 I’ll be teaching ceramics Monday and Wednesday evenings 5:30 – 8:30 pm from June 15th through July 22nd. 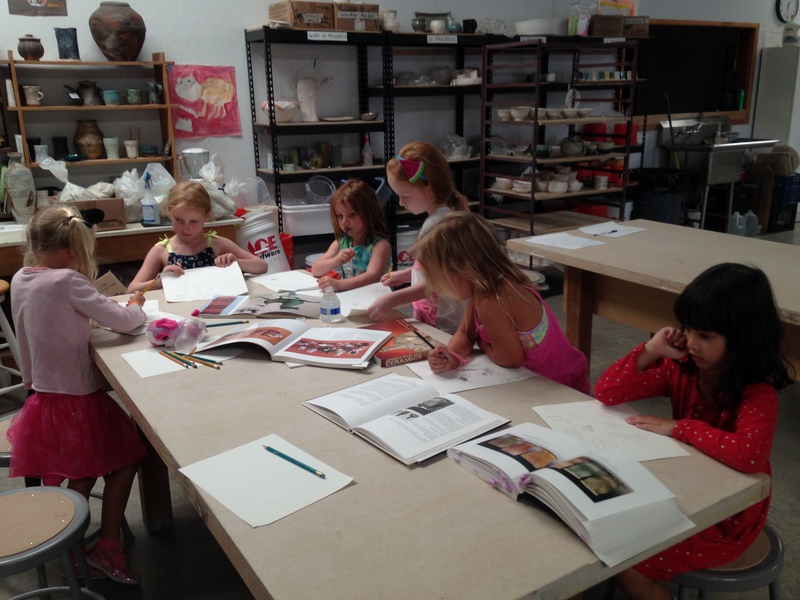 I will also be teaching ceramics at summer art camps for kids June 22nd-26th and August 3rd-7th. I will be hosting Drop-In studios from 1-4 on Thursdays and on Sunday June 7th, July 26th and August 23rd. Looking forward to a fun filled summer in the garden & studio! Spring is officially here! The days are much longer than just a month ago. Seeds are sprouting and buds are bursting all around. The creative energy at Calistoga Art Center is keeping pace with nature’s Spring rush to bloom. 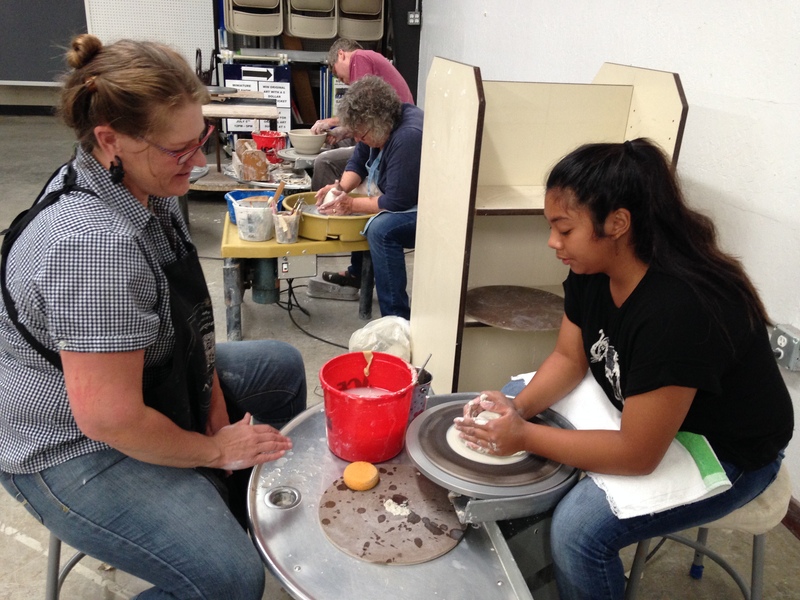 We have expanded both our Ceramics Studio and the Children’s Art Area for our April classes! Come by and check out our AprilArt Explorers Program for 1-5 year olds on Thursdays from 10-11am and our evening Ceramics Classes on Mondays & Wednesdays from 5:30-8:30pm. We are also adding a Drop-in Studio time on Thursdays from1-4pm. Hello! It’s 2015 and life on Cobb Mountain is great! 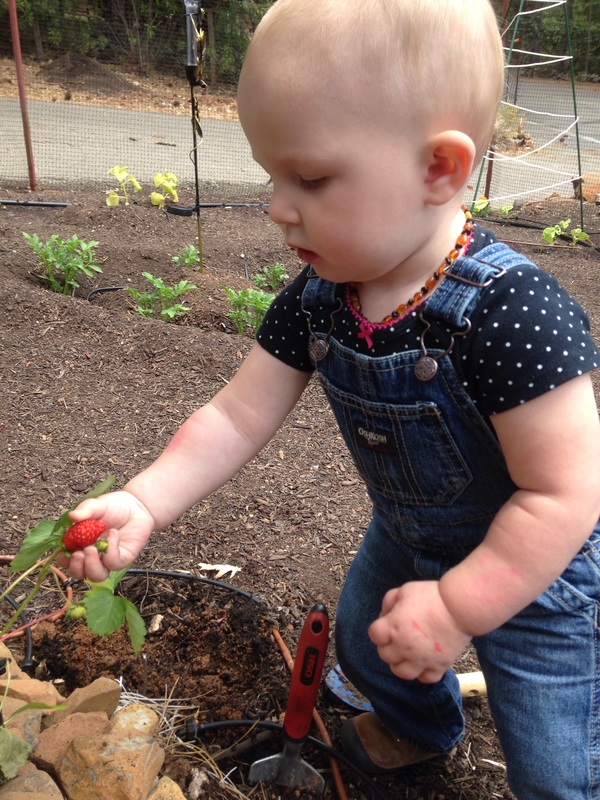 Our little one is growing fast & helping out more & more around the house & yard. She had her first birthday recently, so hopefully she’ll be ready to join me in making things in the studio soon…instead of just eating clay 😜. I’m excited to announce that I will be teaching a class at the Calistoga Art Center in March! Class will meet Mondays & Wednesdays from 5 to 7:30pm for four weeks. I look forward to helping students improve their clay working skills and make some beautiful hand built and wheel thrown pieces. Thanks for stopping by my site. I hope you’re enjoying the lengthening of the days and the awakening of the world to the coming of Spring. 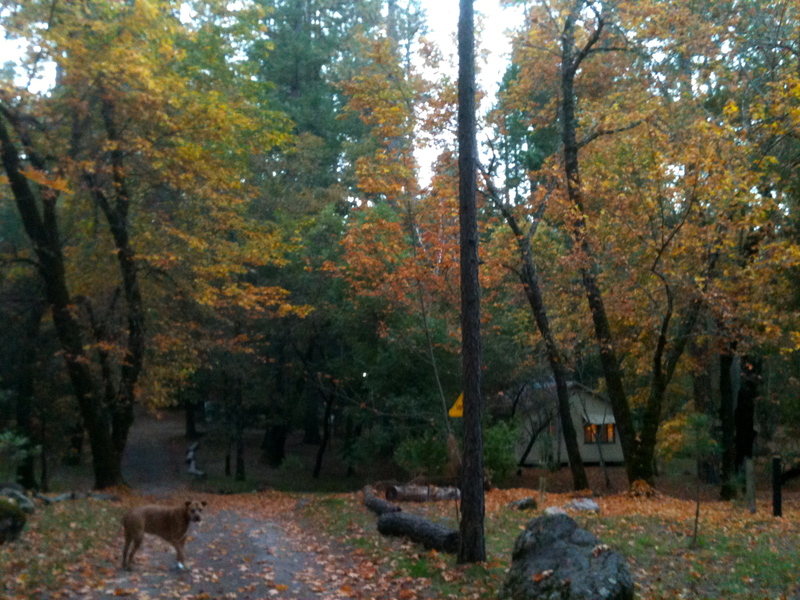 Our first Autumn in Pine Grove has been magnificent. Winter is very near and tis the season for splitting and stacking wood, snowy walks in the woods & dipping cookies in hot beverages. It’s also the time of year to get inspired to tidy up the cabin and studio and decorate for holiday visitors! 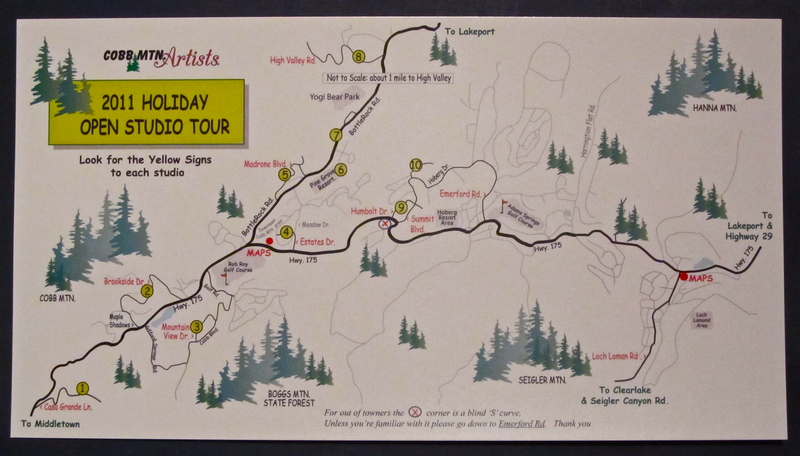 This year, in conjunction with the Cobb Mountain Artists, we are opening our doors for the Holiday Open Studio Tour on December 10th and 11th from 10am to 5pm. Please join us for some home baked treats and a hot cup of coffee or tea by the fire while you explore Cobb Mountain and enjoy the adventure of finding one-of-a-kind gifts from local artists including jewelry makers, woodworkers, painters, glass artists, potters and multi-media artists! The studio shelves are full with recent work from Scott Parady’s June 2011 Pope Valley anagama firing as well as pieces from newlywed Nick Schwartz’s Comptche anagama and Mr. Simon Levin’s anagama in Wisconsin. Leafy lupine blooms blow in the wake of my wheels as I speed through the glory of Butts Canyon…a sure sign of Spring’s arrival…and the momentum of lengthening days inspires the creation of new things. Having set up my first solo home studio surrounded by 100+ foot tall Ponderosas, Sugar Pines and Douglas Firs, I am reminded of the permanence of things bigger than myself…like the pots I produced in 2010 for the Ozumo Santa Monica Project. 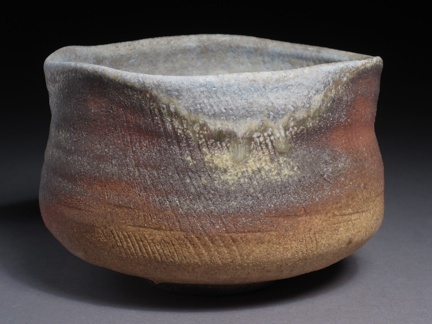 Tea Bowls, Tumblers and Tea Cups…hundreds of them…fired in several different wood kilns including Nick Schwartz’s Flynn Creek Anagama in Comptche, CA Scott Parady’s Burton Creek Anagama in Pope Valley, CA, Simon Levin’s Mill Creek Anagama in Gresham, WI and the CSU Sacramento Smokeless Bourry Box.